Did you know that about 45% of your daily actions are habitual? This means that almost half of what you do is automatic, a routine that you follow almost unconsciously. Habits can make our life easier. They can reduce the number of decisions we have to make so we don’t run down our willpower, or they can improve us, for example getting into the habit of exercising regularly. However, sometimes these unconscious routines can result in less positive outcomes. They can waste our time or even cost us money. Let’s start with one that I am guilty of: coffee. I am a total coffee addict, but I am not alone in loving a good cup of coffee. The average American spends $1,100 per year on coffee, and in the UK, people spend about £700 each year. Reduce that amount in half and you’ll have a $500 emergency fund saved in less than a year. One easy way to reduce your coffee bill is to make it at home. A basic black coffee is about 6 times cheaper if you make it at home. If you are a die-hard and can’t give up your Starbucks addiction, then check out the Confessions of a Starbucks Barista for tips on how to save money. Another habit that I need to change! Did you know that if you leave appliances and electronics continually plugged in and on, it can add between $165 and $440 per year to your electricity bill (depending on your local electricity rates). Look around your home, do you see the lights and clocks on your different appliances – that is costing you money, and it totals about 25% of all energy used by residential customers in the USA. To combat this phantom use of electricity, turn off and unplug your electronics (laptops, TV’s, DVD players, monitors, etc.) when you are done. When you need new appliances, choose energy efficient ones. Retailers are incredibly good at manipulating us psychologically to boost their sales, so we are continually bombarded with messages about the great deals to be had. Since we don’t want to miss the limited time offer or the chance to save 20%, we buy it now. The promise of “Buy 1, Get 1 Free” or getting 40% off is a gain that we find difficult to turn down. Getting a great deal on something is good, but only if you really need it and will use it. If you don’t need it and never use it, how good a deal was it really? The next time you’re faced with a fantastic deal and you think, “Wow, 50% off? I could save $100 on that”, pause for a moment. Instead of thinking about the saving, think of the spending: you’re not saving $100 in this example, you’re spending $100. Is it such a great deal now? There’s another psychological trick that online retailers use a lot: free shipping. You’re on a website and the product you want to buy is $35. That’s all you need but then you notice the free shipping note: “Free shipping – on orders over $50”. And you realize that for only $15 more you can get free shipping: score! If you do find something else for $15 that you need, great; you’ve got 2 things you need and free shipping – go you! However, more often we end up spending extra just to get the free shipping. In this example we spend an extra $15 to get the shipping which would have probably cost $4.99 – so we’ve overspent by $10. Check out if there are any free shipping coupons available. Sites like RetailMeNot or Coupon Cabin have coupons for hundreds of stores. Does the retailer have stores as well as being online? If so, will they ship to the store for free? Try an online chat with the retailer (if they offer it) and ask about free shipping. Shipping charges are the main reason that people abandon their online shopping carts, so the retailer may offer you free shipping or perhaps another discount! Is there anything that friends or family need from the same store? If so, combining your order could get you that free shipping. You could also pay a yearly subscription that covers shipping. Amazon Prime is one example and then there is Shoprunner, which has a network of 100+ stores. For Shoprunner, before signing up check out if your credit card gives you complimentary membership. In 2016, for the first time ever, the amount of money Americans spent on eating out ($54.857 billion) exceeded the amount they spent on groceries ($52.503 billion). It’s not surprising that eating out has become so popular. It’s much easier to get your food delivered than struggle with the hassles of grocery shopping and then preparing and cooking the food. However, eating out is also costly. Research by Wellio shows, on average, that it is 5-times cheaper to make your own meals rather than getting your food delivered. It's also 3-times cheaper to cook it yourself than using a meal kit like Blue Apron. Plus, it’s often healthier! So next time you're thinking about take-out, look for a quick-to-make recipe instead and be kind to your wallet and your waistline! 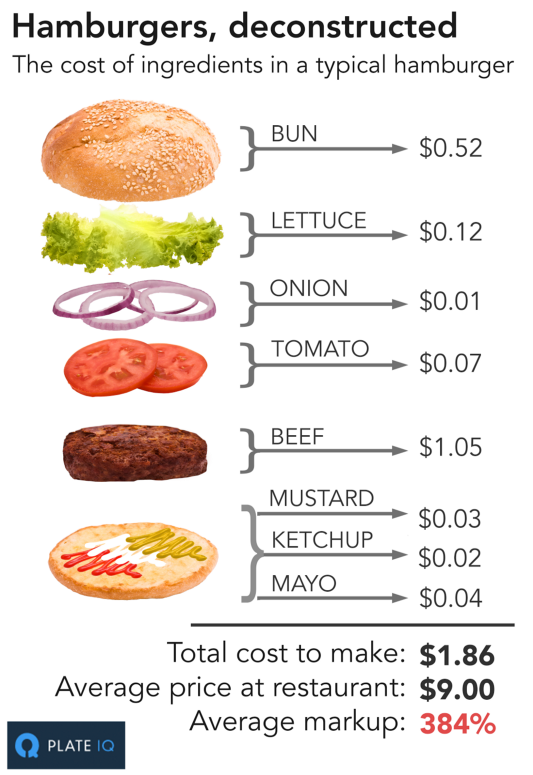 While getting food delivered can be expensive, the cost of eating lunch out can also be very costly. In fact, the average American spends over $2,700 a year on eating lunches out. Since there are about 260 working days per year, that’s around $10 per day spent on lunch. According to PlateIQ, the average markup on restaurant food is 300%, which means you could get the same amount of food for much less if you bring your own lunch rather than eating out. If you can reduce that amount to $5 per day, you would save $108 per month. Save that over 10 years, even with the current, low interest rates, that would add up to about $13,000. That’s just from saving $5 per day on lunch! The average American family of 4 wastes about $1,800 per year in food they don’t eat. A few small changes can save you a lot of money. Check out these tips on how to reduce the waste and save. If you are always rushing around and leaving at the last minute, you might be tempted to break some speed limits to make sure you arrive on time. However, this may cost you. According to Statistic Brain, almost 1 in 5 Americans get a speeding ticket each year. The average cost of a ticket is $152, which adds up to about $6,232,000,000 per year in speeding tickets. That’s a lot of money that could be used on better things! What would you do with $152? Next time, leave earlier and drive slower. As a result you will be saving money by avoiding a speeding ticket, plus you'll use less gas and less stress on your car's engine. In 2017, Americans paid $34.3 billion in overdraft fees. Since the average bank account gets overdrawn 7-times a year, and the average overdraft fee now at $30, that’s $210 wasted each year. To avoid these fees, you can opt out of overdraft protection so debit purchases or ATM withdrawals will be declined and you won’t be charged a fee. (Note: you can still incur overdraft fees from pre-approved payments like checks and recurring billing even if you decline overdraft protection). Another solution is to sign up for banking alerts so that you know when your account is nearing the danger zone and you can avoid these fees. About 60% of Americans don’t pay off their credit card each month and they carry an average credit card debt of $8,683. This means they are paying a lot of interest. For example, let’s say you have $8,683 in credit card debt, your credit card interest rate is 18% and you pay 2.5% of the total each month, and you don’t add to the credit card balance. How long do you think it will take you to pay off the balance and how much interest will you pay? Here’s the scary numbers: it will take you over 27 years to pay off the amount and you’ll pay $12,447.60 in interest: wow! To avoid paying unnecessary interest, pay off your credit card each month. If you have a debt that you need to pay off, check out one of the credit card calculators out there to see how increasing your payments can save you a lot of interest. Also, don't forget to check your statements for unknown purchases. Lastly, if you usually pay off your credit card but forget one month, call up your credit card company and ask if they'll waive the late fees. According to a 2016 survey by CreditCards.com, customers successfully got their fees waived 89% of the time. So it's definitely worth trying. Do you have any other habits that are costing you money? Or have you managed to break an expensive habit? What was your secret?